The Serenity resort is borne out of passion for nature and its preservation. Its caretakers are committed to promotion of sustainable Eco-friendly tourism in Corbett. Solar heating system has been installed to provide hot water and CFLs are being used to illuminate the resort. Serenity resort nestled in a Mango orchard, surrounded by dense forest, hillocks and River Kosi providing picturesque and serene environment to the Guest. 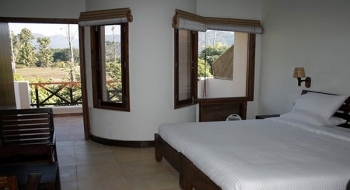 There are 22 air conditioned rooms with attached bath on a total land area of three acres in Serenity Resort in Corbett. The rooms are spacious with two chairs, central table, double bed with side table, spring mattresses, blinds and LCD television in each room. There is tea/coffee maker in each room. The rooms are of two types : Deluxe and Family rooms. Deluxe rooms are on the ground floor with private lawns. Family rooms are on the first floor with duplex for the kids. 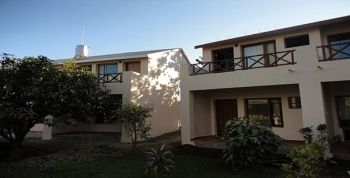 Family rooms have separate balconies and provide splendid natural view. Serenity Resort in Corbett has a multi cuisine restaurant (Gol Ghar). Serenity seasonal vegetables and herbs are grown organically and used in the kitchen. Serenity Resort is 10 km away from the nearest railhead Ramnagar. We provide free pick up and drop facility to our guests. The distance from Delhi to Serenity Resort is 260 kms by road. The route from Delhi is as: Delhi - Ghaziabad - Hapur - Garh Ganga - Moradabad - Kashipur - Ramnagar - Corbett.